I wouldn’t be lying if I said – which I will, and am about to – that I have checked iTunes at least weekly since I discovered it (about 4 years ago now) for literally ANYTHING by the great Australian alternative rock band, Midnight Oil. Known best for their 80s mega-hit “Beds are Burning“, most do not know, however, that lead singer Peter Garrett is not only a former surfer, and a social activist, but also a Christian, and currently serving full-time in the various areas of the political sphere down-under. As some have asked; “Do you remember what it was like to listen to music with a message?” Midnight Oil were like the Australian U2 – and fans of the Cure, the Church, the Clash, or the formerly mentioned kings of Anthemic Brit-rock should most definitely explore their catalog. A great place to start is their compilation, 20,000 WATT RSL, but my personal favorites are BLUE SKY MINING, and DIESEL AND DUST. If you’re going to be scanning singles, check out; “Beds are Burning”, “Blue Sky Mine”, “Dreamworld”, “Underwater”, “Jimmy Sharman’s Boxers”, “King of the Mountain”, “Golden Age”, & “Forgotten Years”. Here’s hoping that Midnight Oil return to the music business soon! ENJOY! My Bloody Valentine have reunited, are playing live, and working on releasing another c.d. Though they may not openly recognize God as the source, the depth of creativity with which they work almost single-handedly reshaped the rock scene in the late ’80s & early ’90s. I wonder if they’re up for trying that again? I hope so! Consider this your coursework for today. Become familiar with the more popular side of Dean Wareham, through his bands’ Galaxy 500 & Luna. These tunes are a happy step back into college for me. Yay. No, not ALL of these songs are ‘essential’, but it is a very solid collection. I remember the Summer after my Junio year in college when a friend of mine (who was also their good friend – I think he was in the studio at some point with the band for all of their first 3 or 4 cds) pulled out a little demo called “Frail e.p.” and asked us to listen. At the time it didn’t really strike me as fantastic – we had been working in the studio on our first c.d., so we were feeling pretty over-confident about ourselves – but they were a good band, and pursuing some of the same ‘edge’ that my band at the time, Set on Edge, were toying with. We (both bands) were still playing coffee-house style venus (shortly there-after we would move up to ‘bars’ – they would move up to ‘stadiums’), so we talked on numerous occasions about doing shows together. In fact, at one point our drummer told them they might consider “opening for us sometime”. In hindsight, that’s quite funny. Through a strange set of circumstances involving one of the their sisters, two singles on their debut full-length ended up being produced by Adrian Belew, the lead singer and one of the guitarists of King Crimson, from whom – oddly enough – I had purchased an electric guitar just a couple years before (he lived in Cincinnati at the time). 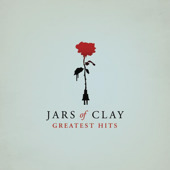 Belew’s touch took Jars of Clay’s sound into top 40 land, and one moment we were making phone calls to still try to finalize pulling together an elusive gig together, the next minute Jars of Clay were the opening act for Sting (you may have heard of him? ), and totally in a league of their own. Since then I’ve bought all of their c.d.’s, and I’m proud to say that they’ve done some really fine work. On occasion I’ve slipped back stage – some of them vaguely remember me. I’m fascinated also by how – in spite of how different our ‘careers’ have been, how our ‘theological journeys’ parallel each other very closely: the signs of that in their songwriting may be one of the reasons I’m still drawn to them, as they always seem to speak to me where I am. As it goes, the world moves on – times change. The largest audience Set on Edge ever had in one room was 3,000, and we only sold a little over 4,000 cd’s in our time – Jars, let’s just say, has done far better. Sometimes it’s odd to look back over your life – not bad, but most definitely odd. That said, pick up one of these two discs. I think you’ll be very glad that you did. Rubber-neckin’ at Dig, Lazarus, Dig! 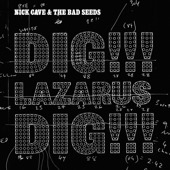 I’ve just listened to Nick Cave‘s new single, “Dig, Lazarus, Dig”, 4 times in a row, and I still want more. Note: I NEVER listen to songs on repeat – NEVER. Like a bad accident – it’s horrifying, but you can’t help but look – this tune is Cave’s attempt to intertwine the Biblical story of the raising of Lazarus with the various legends surrounding the life of the late Harry Houdini. Why? – I have no idea, BUT IT ROCKS with such swagger and groove that I was instantly sucked in! And for any of the other worship leaders who actually might enjoy Cave’s music at times, I found this 2004 article on his bizarre – but apparently ‘Christian’ faith – quite interesting. Be sure to read the whole thing, as the highlights are all on page 3. God is great. He deserves our best – the ‘first fruit’. That is worship: giving God our best. Worship music – and all music made by Christians, which should be an act of bringing glory to God – should be original, inspiring, and – at least in some sense – cutting edge. This is one of the reasons I have been so convicted as of late to write new songs for worship, and to develop my craft as a writer: God deserves it. God is also the creator, which is to say, He is the most creative being in the universe. We’re created in His image. Jesus is restoring us to that perfect image of God – our creator God: the creative God. Though there has been great headway made in this are the past few years, it should be the NORM, not the exception, that Christian be leading the pack in making music that is both excellent & creative, rather than creating more mediocre rip-offs of musical genres that are long passe to the culture at large. Believe it or not, I listen to about 90% music that would be considered ‘Christian’ (as in, the artists either profess faith, and/or are on a ‘Christian label’ – whatever that means, and/or sing songs with messages primarily about Christian things – don’t fool yourself into thinking that all 3 of those must be in place in order for an artist to be labeled ‘Christian’ for marketing purposes, though), most of which is what would be called ‘worship music.’ Artists like Matt Redman, Eoghan Heaslip, Steve Jones, Jeremy Riddle, & the Sovereign Grace team encourage and inspire me: their songs are fresh, Biblical, challenging, and frankly I NEED that – I need to drink from that well. But they have their influences, and I only receive those musical influences distilled – watered-down – when I step into the stream at it’s end. I find it FAR more helpful, and far more challenging for me as a musician and a writer, to wander up-stream to it’s sources. For instance, if you want to be the next Delirious stop sitting in your room trying to play “My Glorious”, and don’t even bother thinking you’re cutting edge by learning a U2 song – pick up My Bloody Valentine‘s LOVELESS (yes, those are GUITARS). Learn “Only Shallow” or “Loomer”, which inspired U2 to make their classic “Achtung Baby”, which then inspired 1,000s of clones in both Christian and Secular markets, even many ‘worship artists’. Besides, if you can work your effects and manipulate your guitar to sound like My Bloody Valentine, you will have no problems pulling off tunes that could tie Delirious in knots if you worked at it. Similarly, if you want to explore the dreamier side of Brit-pop as a songwriter or musician, you may want to pick up “Serene Velocity” – an anthology by Stereolab, even though you’ll understand less than half the words (much of it is in France), and what little you’ll understand will primarily be political pro-socialism garbage. Yes, ahh – the music: a blend of Hip-Hop, Funk, Jazz, Chamber Pop, 50’s Lounge, Vintage Electronica, and ‘Krautrock’ – I THINK it fits somewhere in the ‘Rock’ category, but that’s debatable. I personally discovered a few of their early EPs as I was discovering the whole 4AD & Shoegazer music scenes in the 90s, and they had a long-term influence on my use of counter-melody and syncopation in many of my own songs. Here’s a good, balanced compilation of their tunes from the beginning until now. It might not be your cup of tea, but if you’re looking to expand your palette, here’s a good place to start. And please, let’s not be derivative – good music should open our mind to the almost endless possibilities we have as songwriters and musicians…push yourselves. Remember: He deserves our BEST. Alert! Alert! 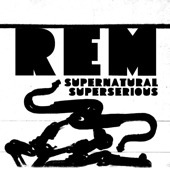 R.E.M., arguably the 2nd ‘biggest’ band in the world in the past 25 years (behind only U2), who have one of the highest paying record deals in history ($80,000,000!!! ), and who have not only been one of my major musical influences through the years (their c.d. GREEN is untouchable in my book), but is also my ONLY major musical influence for whom I have spilled their lead singer’s coffee – R.E.M. has a new c.d. out, and what I’ve heard of it is SMOKIN’! During one of my recent times randomly surfing around iTunes looking for new music (as I am prone to do), I stumbled across an incredible set of compilations from one of my favorite bands in college: Cocteau Twins. May 16, 1973 – I was born in a small town called Georgetown, Ohio – famous only for General & President Ulysses S. Grant and Pro basketball player, and my schoolmate, Brian Grant. Mom’s father, Ted, was raised a Quaker but was an Atheist, I believe due to his extremely dangerous stint as a gunner in WWII, and my grandmother, Rosie, a nominal Methodist who did all of the good things Methodists do, but who didn’t have a very deep faith in God. Are we sometimes overlooking part of our calling as Music Ministers? Not the over-arching general calling, but our specific one: based on the spiritual gifts and natural talents that God has given you is your vision for your ministry all that is could/should be?